I decided to combine September & October books so this post was actually worth your time. I feel like I’ve been super lazy this week post-wise with a shameless plug on Monday and a new book challenge on Wednesday… I’ll try to be a little more meaty next week. Ha. September was rough. I didn’t read very much because I just wasn’t home much. Plus, with yoga at 5:30am M, W, F I was going to bed early and trying to squeeze other things into my evenings. October was a little better. We had a trip planned so I got some reading done while on vacation! So today you’re in for 5 book reviews. Lucky dog. Pictures linked to the GoodReads page! Summary: This is the second book in the Selection series. (I recapped the first one here.) America is now one of six girls competing for Maxon’s heart & the crown. Of course things aren’t easy when you mix in rebel attacks, frosty in-laws, and former lovers. | Why I Read It: I enjoyed the first book in the series. | What I Thought: The love triangle was less obnoxious in this one, but America’s personality became a little wishy-washy; she relied on others to give her confidence (i.e. Maonx, her dad, Aspen). That irked me. I enjoyed some of the twists and revelations in this book- the rebel attacks and formerly undisclosed history of the country surprised me a few times. I liked it enough that I’m moving on to book 3. You Should Read It Because… you enjoyed The Selection and you want to see how America survives as an elite contender. Summary: This is the third book in the Lunar Chronicles. (Cinder and Scarlet are the first two.) This book introduces Cress- a Lunar shell who’s good at hacking and hellbent on helping Cinder & friends take down Queen Levana. | Why I Read It: I’m making my way through the Lunar Chronicles. | What I Thought: Well… I mentioned this book a lot on the blog while I was reading it (and it was 550 pages so it took a while). So far each Lunar book has been better than the one before it- I loved Cress. I loved the friendships and the romances and the adventure. It moved at the right pace and had action mixed with strategy. It was perfect. 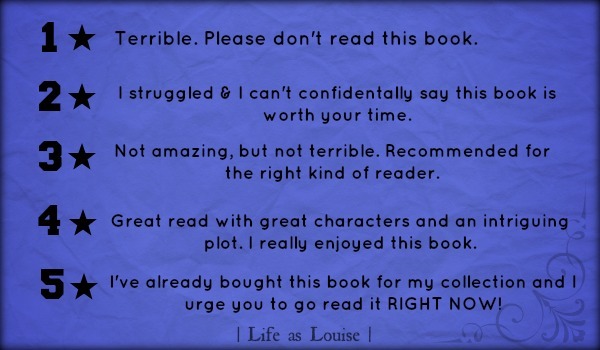 You Should Read It Because… you enjoyed Cinder & Scarlet. Honestly, this series reminds me of HP a bit because the friendship and good vs. evil elements are so strong. Strong characters question themselves and the lines are sometimes blurred. I really like this series. Summary: A short story about thirteen-year-old (Captain) Carswell Thorne. | Why I Read It: According to this site it was next in The Lunar Chronicles. | What I Thought: It was the right story about Carwell’s past to share with readers because we got to see what kind of family he came from, how he behaved in his formative years, and who he is when no one’s looking. It was entertaining to see a very small part from Cress elaborated upon. You Should Read It Because,,, you’re making your way through The Lunar Chronicles and this sheds a little light on Carswell. You Should Read It Because… you enjoy classic literature and you want to get lost in a child’s fantasy novel. Summary: While on vacation a young boy & his grandmother stumble upon England’s most feared, devilish, grotesque predators: Witches! | Why I Read It: I try to read one spooky/Halloween-ish book every October. Plus, I’m a fan of Dahl and his storytelling. | What I Thought: Once again, I struggle with “reviewing” classics (and I consider Dahl to be a classic author). This is a kids book, so the writing is fairly basic. That said, Dahl is an amazing storyteller and I was intrigued the entire time. I loved the little sketches throughout the pages, and the description of the witches and their menacing beahvior was so silly and fun- definitely spooky for a little kid. I bought the book because A) I found it for $2.50 at my local bookstore and B) I want this on my shelves for when we have kids and they have the same creepy interest in Halloween/fantasy that I do. You Should Read It Because: You enjoy children’s lit. and you’ve got a few hours to spend on a creative, masterful 200 page novel. And thus ends Erin’s Reading Challenge for me! I loved The Witches when I was younger! I haven#t read it as an adult though – somehow my sister managed to keep most of our Roald Dahl books! I only have Boy and Going Solo because she didn’t like those ones! I bought it because I love adding to my collection 😉 I now have that, Matilda, and Fantastic Mr. Fox. I want Charlie & the Chocolate Factory and James & the Giant Peach, too! i spent most of this month reading Roots and returned everything else because I wanted to focus on it. Now I have nothing left to read so will check out some of your higher-rated books! thanks for the reco. Quite a few of these are part of a series or two. (They actually are probably considered YA, too.) Regardless, I’d recommend The Lunar Chronicles, at least. Peter Pan was a fun, quick, interesting read, too. Oh I love Dahl!!! I remember reading The Witches quite a few years ago and it has me all nostalgic. I need to go back and re-read it and save it for my daughter! I still need to hop on the Lunar Chronicles. And Peter Pan? How fun! You made me want to read The Witches! I also feel like I need to read Peter Pan. I have read next to none in the way of classic literature…I think I need to change that. I’ve never read a book like Peter Pan- it was an interesting one. (Maybe because it was a play first? [I think…]) I loved The Witches! You should definitely read it. It’s pretty quick, too! um so fun to read a spooktacular book every halloween – what a great idea! i totally want “the witches” to be mine that i read next year! I enjoy kid’s lit every now and then, and I haven’t read a Roald Dahl since I was a kid. The Witches sounds like a perfect October read! You did the best you’ve ever done for a challenge. That’s an accomplishment. I always say that I don’t care how many books someone reads, as long as they feel encouraged to read anything, then I’m happy! Thank you!! Your challenges are always my favorite!